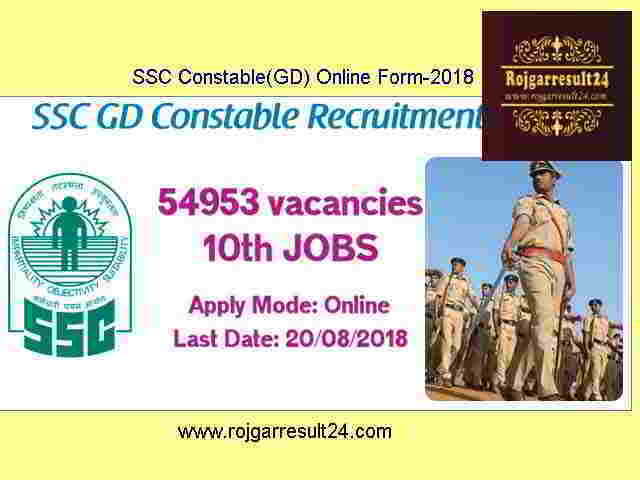 SSC Invite Online Application Form for candidates of General Duty (GD) constable examination-2018, the Staff Selection Commission (SSC) informed the applicants that the facility for submission of online applications, the last date for submission of the applications of SSC GD Constable recruitment has also been extended till 20 August 2018 (5 PM). SSC has announced a massive recruitment drive to fill 54,953 GD constable vacancies–2018 in Many forces including BSF, CISF, and CRPF among many others. It is mandatory for the candidate to pass the matric/10th/high school. any boards. Graduation degree/diploma For Many Posts. 1. The written exam pattern will be based on the newest form. 2. There will be four sections of objective type questions. 3. There will be 25 questions for type and each question will carry one marks.